With 7,000 years of history, the most perfect climate and highest number of sunny days in Europe, English as one of the official languages and incredible cities, towns, beaches and nightlife, it is no wonder that Malta is a popular tourist destination. UNESCO’s world heritage website calls the capital city Valletta – the smallest in Europe, by the way – “one of the most concentrated historic areas in the world”. 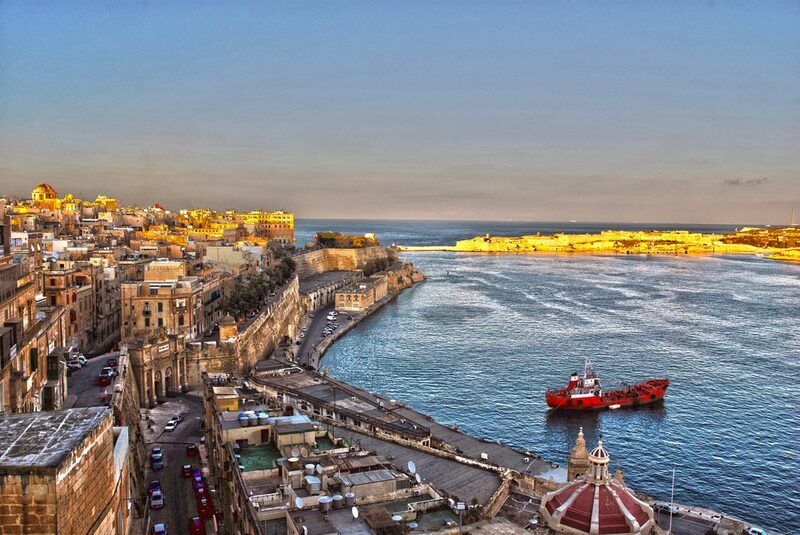 Lets do a quick tour and start with Valletta. The city was founded in 1565. It has the largest harbor in the Mediterranean, and is a magnificent showcase of renaissance and baroque architecture, dominated by churches and palaces and encircled by walls and bastions. The city’s sites and architecture have earned it the nickname Superbissima, or ‘Most Proud’. St. John’s Cathedral was the main church of the Knights of St. John. Dating back to 1577, the exterior of the structure is relatively bland compared to the intricate and ornate interior. Each of the eight language groups of Knights had their own chapel inside and competed with each other for the most impressive decor. The oratory features Caravaggio’s largest painting, the ‘Beheading of St. John’. The tombs of the Grand Masters can be found inside amongst a flood of gold and colored marble. The Grand Master’s Palace, built in 1580 by Gerolamo Cassar, architect of many important buildings in Malta, is now the presidential palace. The state rooms and armory, however, are open to the public. Don’t miss the Upper Barraca Gardens which were the private gardens of the Knights. This is one of the best places to go for spectacular views. Other historic residences include the Auberge de Castille, Leon et Portugal, a renaissance structure with a Baroque facade, which now houses the prime minister’s office. It sits at the highest point in the city and has been described as the finest building in Valletta. The Casa Rocca Piccola is a 16th century palace that was the historic home of the 9th Marquis of Piro, a Maltese aristocrat. There are daily tours as well as a restaurant. There is even a champagne tour led by the Marquis himself. The Archaeological Museum, housed in the French Knights’ Auberge de Provence, features neolithic artifacts unearthed from Malta’s prehistoric temples. One of the most popular museums in Malta is the National War Museum, located at Fort Saint Elmo. The fort was built in 1552 to defend Malta from the Turks. Its construction paid off when it successfully helped to hold off the invading Turks in the Great Siege of 1565. The museum, however, is mainly about Malta’s roles in World Wars I and II, although it does have exhibits dating back to the Bronze Age. Just strolling through this walkable city is an amazing experience to be remembered. Republic Street is the main shopping street. From there, almost any direction will offer steep streets with sea views, bustling plazas, small shops and houses with wooden balconies and quaint cafes. 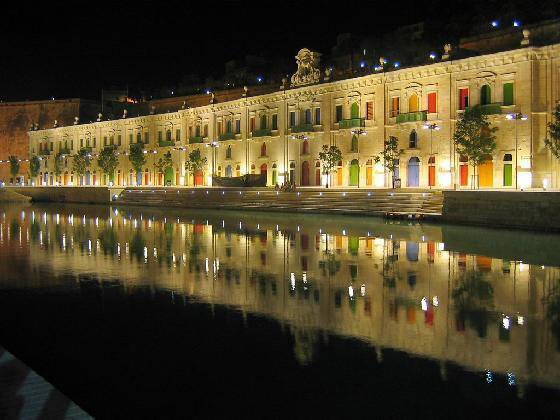 And of course, don’t miss the Grand Harbour! 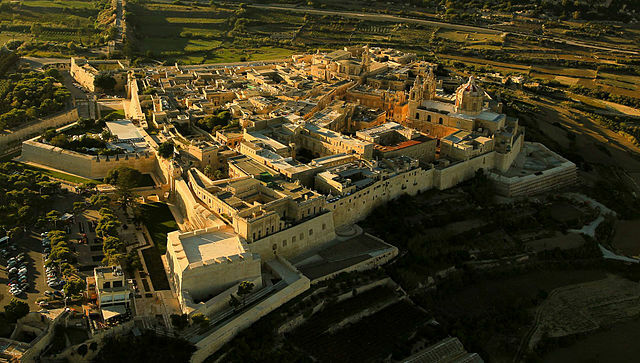 Mdina, the former capital, is a historic walled cathedral city. It is often called the silent city and is car-free. St. Paul’s Cathedral was built on the site where Publius, the Roman governor is said to have met St. Paul when he was shipwrecked on the island. The paintings and frescoes, marble taken from the Roman ruins of Carthage, sculptures and altarpiece make the cathedral well worth exploring. In the evening, the medieval streets are lit by lamplight which adds a romantic old world ambience to an evening stroll. These ruins are located near Valletta and are a fascinating site to visit. 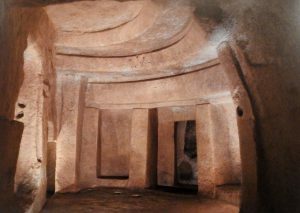 Hypogeum means underground and that is exactly what the Hal-Saflieni Hypogeum is. Closed now, but set to reopen in mid 2017, this underground temple has three levels of chambers connected by archways, halls and steps. The remains of over 7,000 bodies were found in this underground complex which includes an oracle room, main chamber, snake pit, holy of holies and numerous decorated chambers. 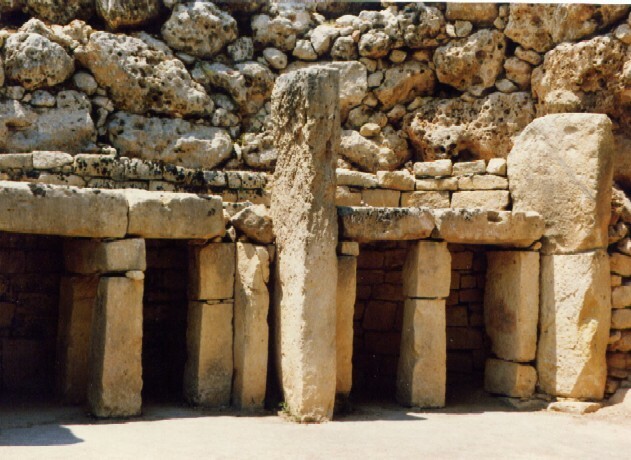 There is an onsite museum which should be visited as well as the nearby above ground temples of Tarxien. These large megalithic temple complexes are located on a high cliff above the southern coast. Well worth a visit, these structures date back as far as 3700 BC and are among the most ancient religious sites on earth. The two complexes are located about 500 meters (0.3 miles) apart and have a visitor center as well as stunning sea views. Among the other towns and villages on Malta are Marsaxlokk, a colorful fishing port and Mellieha, a hilltop town. The first features a picturesque bay filled with colorful boats, a busy Sunday market, numerous seafood restaurants and the popular swimming area, Peters Pool. The painted eyes on the fishing boats, called Luzzus, are supposed to protect the boats from danger. Mellieha sits atop a group of hills on the northwest coast overlooking Mellieha Bay where the largest sandy beach on Malta is located. There are cliffs with cave dwellings, sanctuaries and churches, including the Sanctuary of Our Lady of Mellieha, where St. Luke is said to have painted the figure of Our Lady on a rock. The island of Gozo lies to the northwest of Malta. Small, quieter and more fertile than Malta, it nevertheless has some amazing attractions including the oldest and most impressive temples in the islands. The Ggantija Temples, located at Xaghra, are older than the pyramids in Egypt, or Stonehenge in England. UNESCO claims that they are the “oldest free standing monuments on Earth”. Tradition holds that Ggantija was built by a giantess as a place for worship. 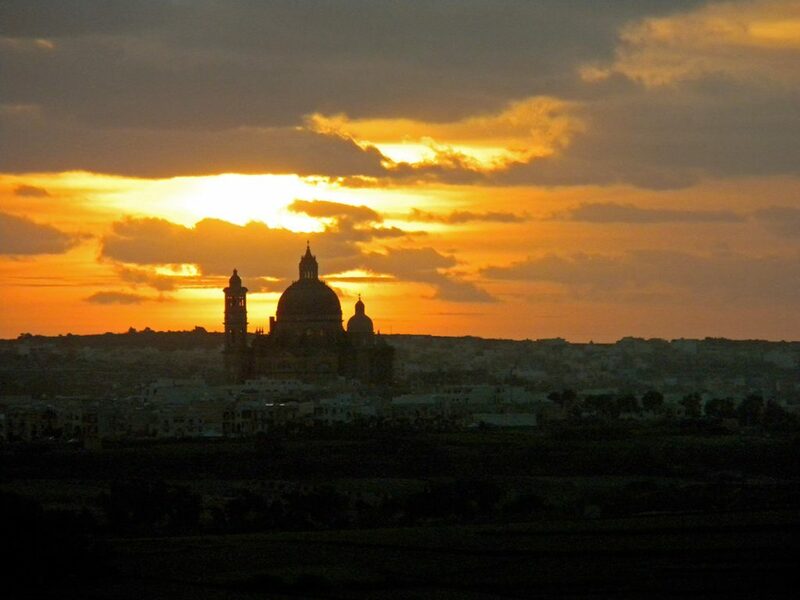 The capital city of Gozo is Victoria. The city was known as Rabat until it was renamed Victoria for the Queen’s Golden Jubilee in 1887. The older Gozitans still call it Rabat. To make things even more confusing, there is also a Rabat on Malta. The city is a maze of narrow streets and alleys and has several impressive churches including the Cathedral of the Assumption, located inside the ancient citadel, built high above the town. The citadel also has a Museum of Archaeology, Folklore Museum, Natural Science Museum and an old prison. There are many other churches, many dating back to the reign of the Knights of St. John. 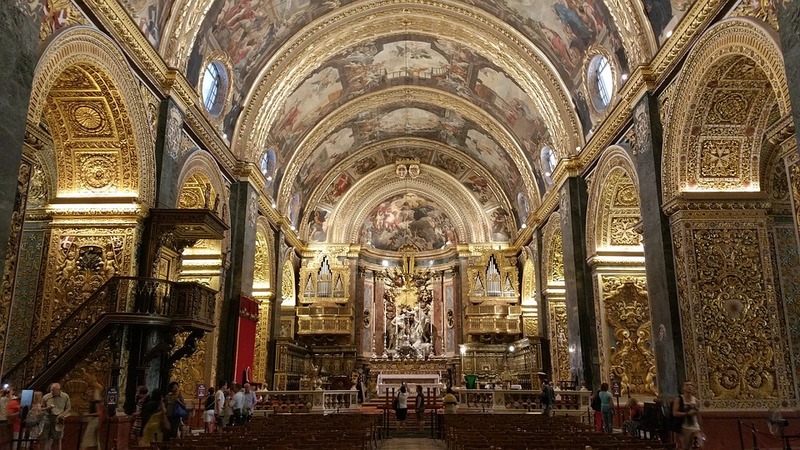 In 1978, in the town of Xewkija, a new church modeled after a church in Venice was completed whose dome is the 3rd highest unsupported dome in the world. There are two popular resort towns, Marsalforn on the north coast and Xlendi in the southwest. There are inland villages well worth exploring. Calypso’s Cave, which is claimed to be the cave in Homer’s Odyssey where the nymph Calypso kept Odysseus for seven years, is located at Ramla Bay, Gozo’s most popular sandy beach. 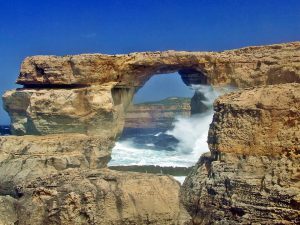 One of Gozo’s most popular attractions was the Azure Window, which collapsed during a storm last month. The popular arch had been featured in the series “Game of Thrones” as well as the movie “Clash of the Titans”. It was not a huge surprise, considering that erosion was expected to cause a collapse at some point, but I’m sure it will be missed. 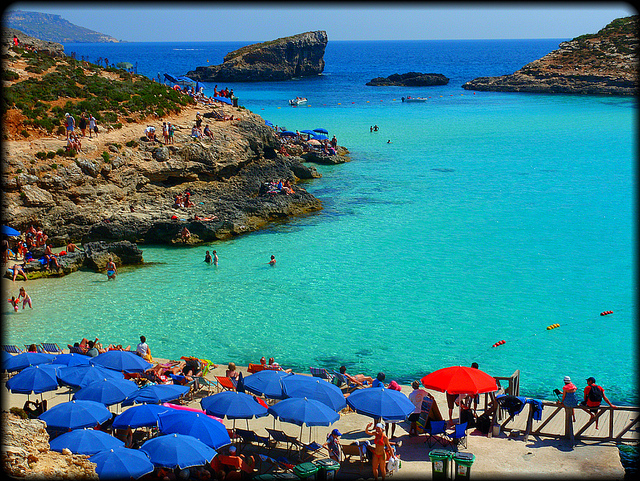 Comino is a small island located between Malta and Gozo. Home to four residents, the island has one hotel, some holiday bungalows and a police station, as well as a tower and a small chapel, both built in the 1600’s. The island’s main attraction is the Blue Lagoon, a popular spot for swimming, diving and snorkeling. Historically a hideout for pirates and a place for imprisoning errant knights, the island has recently starred in films such as “Troy”, The Count of Monte Cristo” and “Swept Away”.